From being the number one foe to the best of friends, siblings share it all and create the most amazing bond of love. Relive those memories of childhood despite the distance. Send rakhi to Delhi to your dear brother and bring back the good old days of togetherness. The festival of Rakhsha Bandhan brings tons of reason to smile and create wonderful memories for siblings. With the festival, comes a reason to rejoice and celebrate the inseparable bond between a brother and a sister. And with Rakshabandhan around the corner, you can relive those memories once again. No matter how far you are, you can always send rakhi to Delhi and make your presence felt anytime. And to do so, you don't have to travel distances to make the moment memorable, as with Floweraura, you can even choose the latest rakhi online and send it to Delhi with some really amazing designer rakhis that would adorn your brother's wrist. In fact with FlowerAura, you can send best rakhi for brother online anywhere in India even in the remotest cities. Whether you are staying with your brother together or you both are separated by kilometers, we are here to bring you together via our exclusive range of online Rakhi in Delhi and the hassle-free online Rakhi delivery to Delhi. 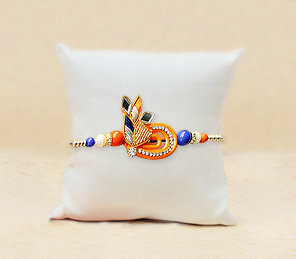 We will ensure to send Rakhi online and also, that the Rakhi delivery in Delhi is on time. Not only in this particular city but we are also available in more than 200+ cities where you have an option for free home delivery benefits. If you are worried about the fact that Rakhi won't reach him on time, don't you worry at all. With our express delivery, we assure same day delivery of the precious bond of togetherness, Rakhi. We have the most diligent team which understands your emotions completely. Hence, just log on to our website and send Rakhi to Delhi online selecting from not one but many options. We have the best Rakhi combo that can outrun any Rakhi combo from any local gift shop. We also guarantee to send Rakhi to Delhi within the same day itself for your brother residing in the city. For a sister, who wishes to celebrate Raksha Bandhan in its true vigor, we will make our best foot forward in order to fulfill her wishes and to make her Rakhi moments memorable. With the festival of Rakhi around the corner, there must be so much going in your heart and mind. And the fact that you are away from your dearest brother makes you miss him even more. So, even when your brother has moved to Delhi, you can make him feel special and loved and missed. We have the perfect combo for the auspicious occasion of Rakhi which celebrates the eternal bond between you and your brother. We have infinite assorted mesmerizing collections so that you can easily choose from a grand collection of combos and hampers and send your Rakhi to Delhi. Ranging from Zardosi, Mauli, Kundan, Rudraksha, we have an evergreen array of Rakhis. Even, if you're wishing to find one of a kind pearl Rakhi, we are brimming with plenty of choices to choose from so that you can make your selection and send pearl rakhi online to Delhi. So just book with us and leave the responsibility of timely and fast delivery to our team that too with the benefit of free shipping. The variety of rakhi that we have managed to keep is something very special. The next point of attraction is the Kids' Rakhi. You can order sets of rakhi for kids online, we have enormous designs with cartoon characters on Rakhi threads. We also have today delivery option if you are late in ordering rakhi gifts for your brother. Together with rakhi, we have a huge collection of gifts for sisters which includes teddies, chocolates, perfumes, flowers, dry fruits and many more items. If you are looking for the best gift for your sister we are the one-stop solution. All you need is to visit our online portal and place your order. So, celebrate this Rakhi with Floweraura to get best deals and to relish instant online Rakhi delivery in Delhi. Wish you all a very glorious and memorable Raksha Bandhan. Living too away to celebrate the selfless bond of siblinghood? Well, revive the memories of childhood with your brother this Rakshabandhan by sending him the most scintillating Rakhi from FlowerAura's Rakhi Collection. With the option of same-day Rakhi delivery in Delhi from the USA, UK, Australia, Canada, UAE, Dubai, Germany, Singapore, Saudi Arabia, plan an amazing celebration on this day despite you are far off. As it is known, Rakshabandhan is one such occasion that celebrates the bond between a brother and a sister. From being your evil half to your best friend, your brother is one of the best things in your life. Celebrate that beautiful bond and make your brother feel loved and adored like never before. FlowerAura's exclusive collection is your right place to be. If you wish to send Rakhi to Delhi from abroad, you can count on FlowerAura and get smiles delivered at your brother's doorstep.